ADT and relative newcomer Frontpoint stand head-to-head as rivals in the home security industry. While some of their offerings can seem similar, today I’ll show you the key differences that may help you in your decision making process. ADT customers like their big brand name and the trustworthiness of their service. Frontpoint seems to deliver on customer support as well.. Something ADT is infamous for dropping the ball on in many cases, as you may have heard. Even though ADT is such a monster in the industry, Frontpoint has aggressively taken them on with emphasis on the newer cellular/GSM technology, making ADT’s landline use look very aged and unsecure. So which company is best for you? We have compiled a comparison of the two to help you in your decision process. Who Has The Better Equipment? Frontpoint believes in a future free from using tradition phone-lines. 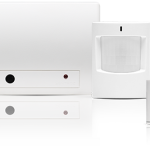 Their systems use 100% cellular-GSM communication, which helps with faster response times between the alarm and monitoring station and amps the safety feature of the system because if the power is cut to the alarm, the signal can still travel through the cellular monitoring. ADT is still a landline-based company (unless you are willing to make an expensive upgrade). With a landline connected system, there is risk if the power goes out or if an intruder tampers with wires. Communication can be disrupted. The savings with a cellular system can also be considerable because there is no need for a monthly landline subscription. The only possible complication can come into play if you live in an area with very bad cellular coverage. 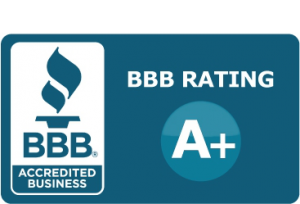 ADT has a B+ Better Business Bureau rating, even with its longer reputation for business. Frontpoint maintains an A+ rating thanks to their 97% customer satisfaction rate. Both ADT and Frontpoint offer two similar kinds of systems but each of them have their own different features, not to mention very different prices and fees. $35.99 monthly fee with a 36-month contract. Frontpoint sells their equipment for $399.95 but provides a $300 discount if you sign a 36-month monitoring contract with the company. They offer small length contracts for a higher initial price and no discount. Some go with the longer contract because of the amount of money saved. When installing an ADT package, an ADT representative will come to your house to complete the install. Frontpoint is fully wireless and offers easy DIY setup. Simply peel the double-stick backing and place your sensors wherever you want. The batteries last several years, and if you want it moved, it can come off with ease to be relocated. Update for June 2017: Frontpoint now offers a personalized setup wizard for added convenience. Following this setup wizard, you no longer need to call Frontpoint to activate your system. Still, if you prefer to talk with someone on the phone, their support team is great and I highly recommend speaking with them for any issues. I waited a long time to activate my system (life happens) and by the time I called them 6 months later, my control panel’s rechargeable battery was not working anymore – they kindly overnighted a new control panel to me. Over the 36 -month contract, Frontpoint costs $34.99 per month. ADT is just a dollar more monthly, but keep in mind that you have to do the $250 rebate and follow the instructions closely, or else you can be hit a high of $45.71 a month. Plus, ADT has additional costs for installation. ADT is a little more risky with their $250 rebate and specific requirements to save that money, so you’ll need to make sure you don’t get any hidden fees and unpleasant surprises. If that sounds bad, you’re right – that’s the typical home security industry our parents had to deal with. Thankfully, Frontpoint takes a much more customer-friendly approach. Both ADT and Frontpoint offer 36-month contracts. Reduced contracts are available. However, the $300 equipment discount will not be available, and the monthly fee will be higher. As for equipment quality, Frontpoint uses a state-of-the-art Qolsys IQ Touch-screen control panel and wireless devices. 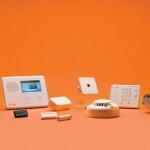 ADT uses Safewatch Pro 300 Control panel and hardwired pieces of equipment. Hardwire means holes in walls, wires, and equipment is harder to relocate in needed. Wireless allows freedom from these things but can make the pieces easier to be tampered with by an intruder. Want more? Frontpoint also offers a key fob to control your system away from the panel. ADT does not include this in its basic package. For many customers, cellular/GSM would make Frontpoint’s security system the frontrunner in the security industry, but many customers like ADT’s history in business. They prefer the brand name in their home because there is a long-standing reputation associated with the name. When making your own decision, take in everything discussed into consideration and pick which company best suits your needs and lifestyle. 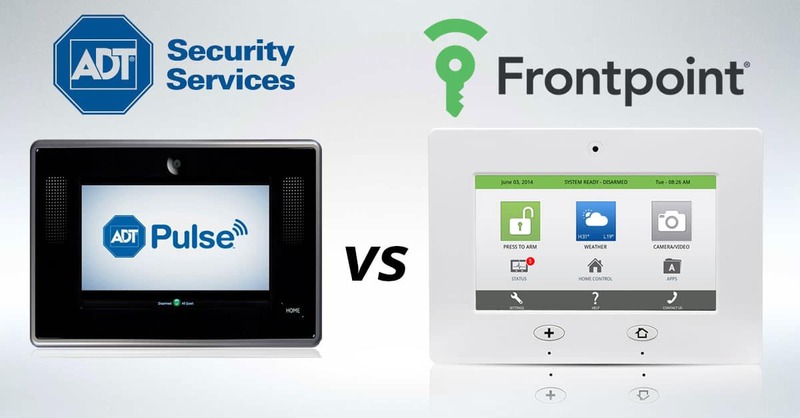 Frontpoint remains our top pick for home security. 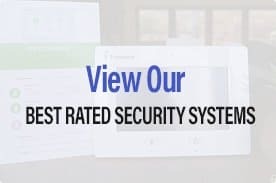 To see a more in-depth look at Frontpoint, check out our fact-filled review of Frontpoint’s home security system and plans. Want to get a quote from ADT? ADT is fragmented with thousands of dealer installers across the country, all with different pricing schemes. So you’ll be forced to find a local dealer and contact them. One thing to be adamant about is to get at least a ballpark estimate on the phone before you let the salesman come to your home. It can get a bit high-pressure having a salesperson in your home. 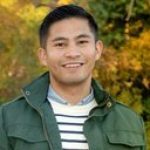 Want to get a quote from Frontpoint? It’s easy. Just go to frontpointsecurity.com and select your property type (homeowner, rental or business). Answer a few quick questions and you’ll get a free quote with your exact equipment costs, monitoring costs, a limited time special offer, and of course you get to try your Frontpoint system risk-free for 30 days so you know if you want to keep it or not. If you decide Frontpoint isn’t for you for any reason, you get 100% of your money back. No restocking fees. No processing fees.